Sauté the onions over a medium flame, stirring very infrequently. Make sure the onions are spread as evenly as possible across the pan. Every few minutes, scrape the bottom and redistribute the onions so each gains the maximum amount of surface area. The intention is to slowly crisp the onions by enticing the remaining liquids to sweat out, and for the onions to sweeten by condensing in their own juices. This process takes about 40 minutes. When the onions are dark brown, but not burnt, add the paprika, cumin, and season with salt and cayenne to taste. Set aside. In the meantime, peel the sweet potatoes and potatoes and cut them into 1-inch cubes. Place them in a large pot and cover with water by two inches. Bring to a boil over high heat and simmer the potatoes until fork tender. Drain and set aside in a large mixing bowl. When it comes to the mashing, use whatever technique you like. I find that the best texture is achieved by using a food mill (or mouli, as my mother calls it), or a ricer. You can use a hand masher for a more coarse result. Food processors will render the texture gluey - avoid. Once you’ve mashed your potato mixture, season to taste, adding the chili powder and a dash of cayenne to give it some heat.Thin with some chicken or vegetable stock if too thick. Transfer the potatoes to a casserole and spread in an even layer. 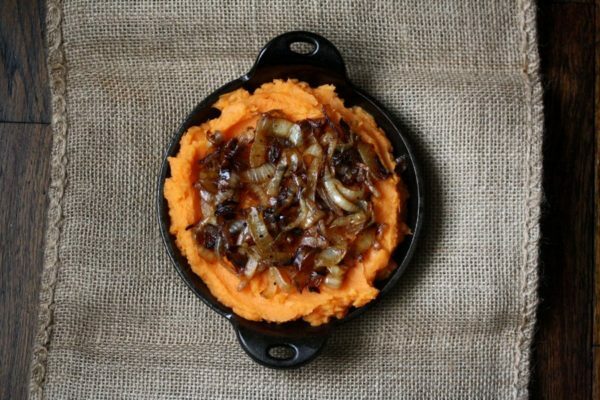 Top with the caramelized onions and serve immediately.